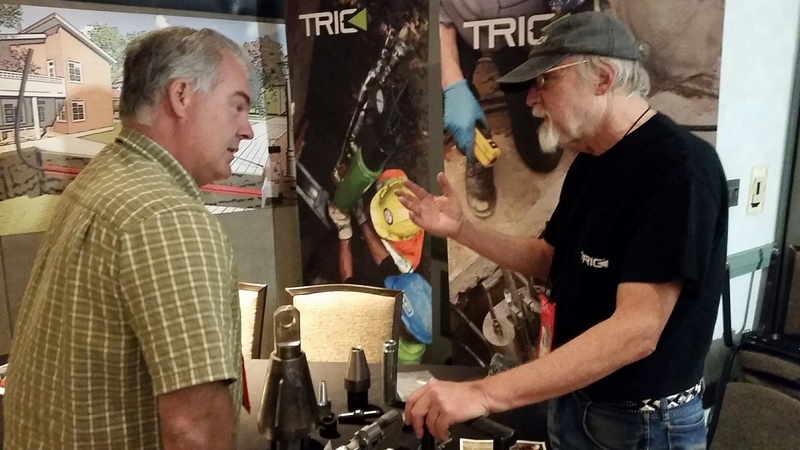 TRIC Tools showcased its X30 lateral pipe bursting equipment at Harvey's Casino in Lake Tahoe at the 115th Annual California State PHCC Conference. California Pipe Bursting Manufacturer TRIC Tools enjoys supporting local and national plumbing associations. One of the organizations that TRIC works closely with is the California Plumbing, Heating and Cooling Contractors (PHCC). The PHCC Association gives Plumbing, Heating, Ventilation, Air Conditioning, & Refrigeration (HVACR) contractors the resources they need to be the best and to continually improve their services. 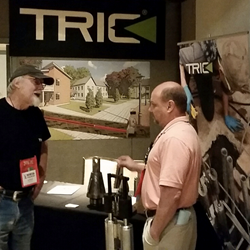 While at these events, TRIC educates itself to the challenges these PHCC contractors face. Sales Executive Jay Battin and CFO Michael Lien represented TRIC Tools at the 115th Annual California State PHCC Conference in sunny Lake Tahoe May 13th. Both Jay and Michael were impressed with both Harvey's hospitality and the crystal clear air of Lake Tahoe. During the event, Dr. Jack Wolf spoke to attendees about leadership, productivity, sales and communication. Rutland Walker spoke about cracking through all of the social media with Understanding Consumer Behavior. Walker explained how to generate more revenue through better leads and cut expenses and improve profitability. Jay and Michael enjoyed meeting PHCC members they had not met at other PHCC events this year. Mr. Lien met National PHCC Senior Vice President of Member Services and Customer Care. "Both Jay and I really enjoyed the show as it not only gave us a chance to catch up on the industry but also meet some of our friends who've helped introduce TRIC to the PHCC members over the past decade," Mr. Lien said. In Tahoe, TRIC was able to re-connect with California Executive Vice President Tracy Threfall, California President Louis Senteno, Director Julio Jaime and California PHCC President Elect Geno Caccia. TRIC’s Pipe Bursting units combine compact size and ease of use while harnessing enough power to burst 4" to 6" sewer laterals. The X30 also is able to replace 3/4" to 1" water and gas lines in an attractive package. TRIC has led the way in providing Lateral Pipe Bursting equipment for contractors since 1996. Jay said, "I enjoyed sharing our compact technology in a relaxed and fun environment." He continued, "It was also nice to have PHCC members close by who've had much success with them for over a decade." For more information about Trenchless Pipe Bursting equipment or the Trenchless Industry in general - please call 888-883-8742 or visit TRIC's website at: http://www.trictrenchless.com to see how they can answer any of these questions for you. Get your Trenchless Sewer and Water Replacement service off on the right foot, and help get you profitably pipe bursting. 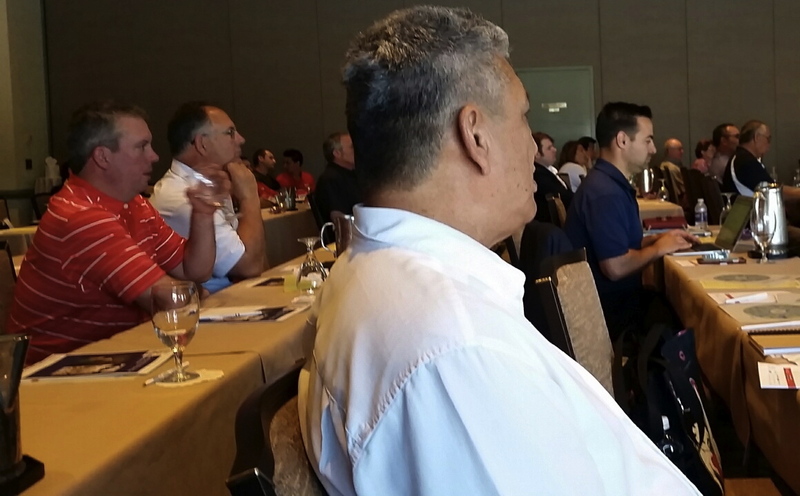 Mark Jordan of Jordan Plumbing with Jay PHCC members enjoy Federated Insurance seminar.